WHAT IS GIANT PAPILLARY CONJUNCTIVITIS (GPC)? Conjunctivitis is an inflammation or infection of the conjunctiva -- the pink mucous membrane lining the eyelids and the structures of the eye. Giant papillary conjunctivitis, also known as GPC, is a condition of the conjunctiva in which the structures known as papillae (glands) in the upper lid become enlarged. In severe cases, the enlargement of papillae is accompanied by itching and mucus discharge. IT IS NOT CONTAGIOUS. It is not an infection. 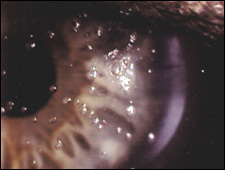 Protein coating and lipid deposits on soft lenses are a common cause of GPC. With the incresed use of daily disposable lenses, GPC is much less common. In the mild stage, reduced contact lens wearing time is the most common symptom. Many factors can affect comfortable wearing time, such as lack of sleep, environmental irritants, or dry eyes. However, persistent loss of wearing time, in the absence of identifiable reasons, may indicate an early stage of giant papillary conjunctivitis. The patient has begun to feel discomfort when wearing contacts, but there is no obvious buildup of deposits on the contact lenses. 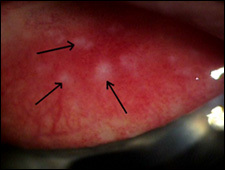 There is a mild increase in the amount of mucus present in the morning, and mild itching occurs when lenses are removed. A light coating of material has been deposited on the lens and enlarged papillae are forming. Additionally, small amounts of mucus are present over the papillae. Mild redness of the eyes occurs, and there is an increase in the amount of mucus present on awakening. Itching on removal of lens becomes more severe, and the wearer is much more aware of the lens late in the day. There is a medium to heavy coating of deposit material on the lens. The number, size, and elevation of papillae increase; there is a great deal more redness and swelling of the conjunctiva. 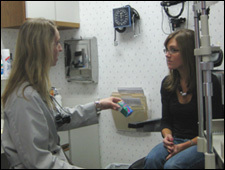 Moderate to heavy mucus is often present in the morning. Itching on removal of lens may be moderate to severe and may vary on a daily basis. The severe stage is accompanied by a heavy deposit of protein on the lens. Papillae increase in size, number, and elevation. Redness, swelling, and mucus production become more severe; and some changes in the cornea may be present. Heavy mucus production is noticed on awakening and eyelids may stick together. Giant papillary conjunctivitis can be a disappointing, discouraging condition since it is primarily caused by long-term use of contact lenses. Some contact lens wearers who have enjoyed wearing lenses for many years become intolerant and must either return to glasses, go to one day disposable lenses or have LASIK. Giant papillary conjunctivitis can usually be treated. Discontinuing lens wear is usually required to treat patients who are in stage 3 or 4. Also, the instillation of anti-inflammatory eye drops helps to speed recovery. Decreased wearing time, more frequent lens replacement, or a diligent cleaning routine may be all that is necessary to improve the condition at earlier stages. The most effective, easiest treatment of giant papillary conjunctivitis is simply to discontinue contact lens wear. When the patient ceases wearing lenses, the symptoms usually disappear with time, which varies from weeks to months. Of course, many contact lens wearers find this an unacceptable solution. It may become more palatable if they understand it need not be forever. If the eyes are given an opportunity to recover, contact lens wear may be possible at a later time. Because it often becomes a chronic condition, even after a break, the problem may reoccur when lens wear is resumed. We will work with you and explore every possible alternative. For instance, when eyes have recovered, contacts might be tolerated better if worn on a more limited basis. Another possibility is that a change in the type of lens worn may be beneficial in preventing the re-occurrence of GPC. Simply replacing the old lenses with new ones is often helpful. Daily disposable lenses are a good option for those who experience problems. These are lenses that are worn for one day and then discarded. Even though we do not know exactly what causes giant papillary conjunctivitis, we do know that protein deposits are likely a contributing factor, so meticulous attention to cleaning is important. In addition, a well-fitted pair of contact lenses is essential to prevent problems such as giant papillary conjunctivitis. Giant papillary conjunctivitis is treatable, and there are many options to explore before giving up on contact lenses. Working together, we can explore alternatives for care and develop a plan for continuous clear and comfortable vision.